Auto on the Edge of Time was a series of installations and projects that explored the effects of domestic violence as experienced by women, children and families throughout the United States. The centerpiece of the project was a collection of wrecked cars transformed by Lacy and her collaborators into sculptural testimonials on themes of escape, abuse, control, support, healing, memorializing and more. With sculptor Carol Kumata, Lacy created three sculpture cars representing different aspects of family violence: the car of interior and exterior monologues with hundreds of keys stuck to its floor; the car of escape plans with “to take” lists flying out of suitcases; and the car of memory, a burnt-out wreck with bronze plaques for 181 victims of family violence who had died in Pennsylvania during the construction of the piece. The project was named after the history of the Underground Railroad, active in Pittsburgh during slavery. Today’s “underground railroad” is the escape route in the family car, as women run from violent households. The cars were placed in Pittsburgh’s Three Rivers Park as part of a yearly art festival, along a 180-foot railroad track that led to a phone booth. A poem describing a woman who went underground to escape violence was inscribed on the railroad ties, readable only by walking along the ties. At the phone booth, visitors could select from three options: talking to a live person, listening to audio recordings of women who had escaped from abusive situations, and an invitation to record your own story. Men and women left messages that now constitute the soundtrack of a fifteen-minute documentary video by Mia Houlberg. Three Rivers Art Festival, curated by Jeannie Pearlman. Produced with support from the Greater Pittsburgh Women’s Center and Shelter, Pittsburgh, Pennsylvania. Lacy spent a year of preparation working with My Sister’s Place, a domestic violence shelter in White Plains, New York, and 15 women in the Family Violence Program at the Bedford Hills Maximum Security Correctional Facility to develop a two-week workshop during which the inmates created three sculptural cars. The conceptual and material content of each car was developed through extensive group discussions. The “Abuse Car” featured a distorted apartment inside with household objects and writing that graphically described how each object had been used against the women. A figurative brick wall installed inside the second car listed the prison sentence of each woman and symbolized the wall of silence many women encounter when they seek help and find none. One woman reported a sexual assault at age 15 and her social worker suggested she start taking birth control pills, as she would most likely be victimized again. 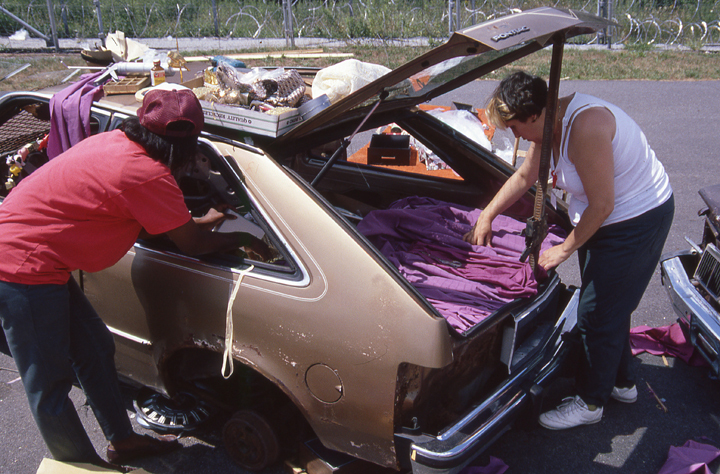 The “Healing Car,” wrecked on the outside but filled inside with photos and other precious objects from the women’s personal collections, recognized that the women relied on each other, family and friends for strength and community. Their cars premiered at the prison in a small exhibition and were later exhibited at Bennington College, Niagara Falls, and at the Snug Harbor Cultural Center on Staten Island. Participating artists include Virginia Cotts, Sharon Smolick and Charlotte Watson. With Thea Litsios, Sue Reeves, Sharon Smolick, and David Katsive. The project was a co-production of Artpark and the Public Art Fund, with sup- port from Elaine Lord, warden at the Bedford Hills Maximum Security Correctional Facility, Bedford Hills, New York. After the women from a prior project at Bedford Hills prison suggested that Lacy look more closely at the impact of family violence on the lives of children, she produced a work for the Cleveland Center for Contemporary Art with the Center for the Prevention of Domestic Violence. Young children, mothers, and counselors were interviewed at the shelter/center, and in a series of drawing work- shops children were encouraged to explore their feelings through art. They drew scenes of their homes, neighborhoods, and family on the doors of cars displayed inside the museum; other drawings were translated onto the flat white surface of the inside and outside of a wrecked station wagon that was installed outside the Center of Contemporary Art. Lacy, Virginia Cotts and David Katsive produced a series of public service announcements with the children and their mothers. The six sculpture cars created in Pittsburgh and Bedford Hills were shipped to an abandoned gas station in Niagara Falls, less than a mile from the honeymoon capital of the world. Inside the gas station, children's images of domestic violence were drawn directly onto the walls of the garage. Outside, the "Abuse Car," the "Brick Wall Car," the "Healing Car" from Doing Time and the "Key/Control Car," the "Escape Car," and the "Memorial Car" from Underground were all parked on the lot. The installation was open for two weeks, during which the site was used for rallies, presentations, and meetings on the topic of domestic violence. The seven cars of the series were shipped to the Snug Harbor Cultural Center as part of a retrospective on Lacy’s work on violence (from 1972-80). Prior to the installation, wrecked cars with crude warning signs about driving and drinking had been placed at roadside locations across Staten Island. Each of these “installations” was signed by the local borough chief, Guy Molinari. Five of Molinari’s cars were commandeered, painted bubblegum pink, and reinstalled in strategic sites around the island. The sign over each car was inscribed with warnings and statistics on the dangers of domestic violence. During the development of The Oakland Projects with teenagers in Oakland, California, violence surfaced as an important issue in the lives of several of the young women students. Channeling their own experiences, these young women worked with graphic designers and artists to create Signs of Violence, a set of authentic full scale street signs, with text and images re-configured around themes of domestic violence. The signs were fabricated by the California Department of Transportation and exhibited at Snug Harbor Cultural Center as part of Lacy’s retrospective.